Williams Interactive is regarded as one of the top-tier online gaming software developers in both the online and offline platform. The developer has made some innovative moves over the years, one of them being the use of colossal reels in some of their slot machine games. 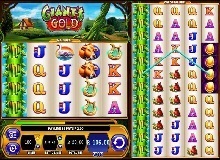 Even though this arrangement does not play by the conventional rules of slots layout, it was well accepted online and prompted the release of another slot, Giant’s Gold. 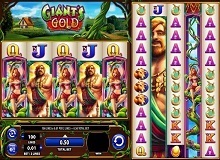 Giant’s Gold slot is developed using video technology that uses modern graphics and animations. In it, the popular tale of Jack and the Beanstalk is used as a theme inspiration, which has made it grasp the attention of many gamers. However, in this set, Jack is replaced by a young lady who is adamant on the same mission to steal the gold after climbing the beanstalk. The arrangement of Giant’s Gold casino slot online is different from what most gamblers have come across. Two playing grids are placed side by side with one spotting five reels and four rows while the other has five reels and twelve rows. The play lines running across are one hundred and can be adjusted. Gamblers can play Giant’s Gold slot machine online in numerous casinos online in both download and no download modes. The latter requires the installation of a flash player in the web browser being used. This is to avoid glitches when playing. 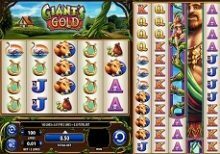 The giant beanstalk is the wild in this slot and can be used to stand in the place of other icons to complete winning combinations. It can replace all other icons with the exception of the scatter, which is denoted by the golden egg. The lady character can also not be replaced since she is a bonus trigger. 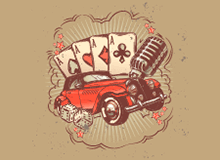 Winnings are collected once players land three or more similar icons on an active bet line aligned from left to right. Payouts are granted in the form of credits that differ depending on the symbols forming the combo. The lowest paying icons are the poker card values, which is similar to most other slot machines. The wild cannot be used to form combinations of its own. A free spins bonus can also be encountered when playing Giant’s Gold for real money. The offer is triggered by three or more scatter icons, and they only make an appearance in the first, third, and fifth reels for both the main and colossal reel set. Players can trigger up to one hundred free spins thanks to the retrigger feature that is included. Any winnings that are made from the colossal reel are subject to a two times multiplier. The freebies are played immediately they are triggered. No jackpots are featured in the set. Giant’s Gold can be played for real money wins in numerous casinos online by placing cash wagers. Those not willing to put any money on the line can opt for the free version that comes with fun credits to use in the place of money. However, cash winnings cannot be collected from this variation. In both modes, Giant’s Gold has a Return to Player rate of 96.21%, which is pretty impressive. Even so, gamers should note that this RTP percentage does not give a definite figure of how much they can expect to win after playing for some time. Giant’s Gold can be found in most Williams Interactive casinos. It is important to engage the set in a licensed gambling destination to avoid those that cheat to dupe gamblers out of their winnings.